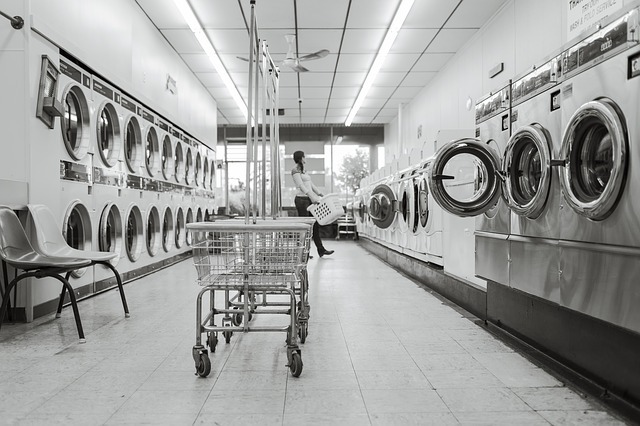 The girl stood at the laundromat, watching the dryer spin her clothes, listening to the rhythm of the humming machines. She thought about all the mistakes she had made in her life and sadness filled her. She didn’t know how to make her life better, or who to turn to. She just knew it hurt – deep inside. An older man entered, carrying a hamper filled with dirty blankets. It looked awkward and heavy and he was struggling to carry it, so she offered to help. He accepted with a smile, and they each took a handle as he pointed to the washer he wanted to use. The pair set the hamper in front of the machine and the girl headed back to her dryer to check the time and see how much longer she would have to stand there. The older man fumbled with his laundry, dropping things and then struggling to pick them up from the floor, so the girl went over to help him again. He stepped back and let her load the machine for him. Once the machine was loaded and ready, the man started to put his coins in the machine but he was a quarter short. The girl pulled her last two quarters from her pocket and the man stared at her in surprise as she dropped them into the machine. She could sense the his gratitude, and it felt good knowing she had helped someone, even while she was, herself, in such a bleak state. The man watched her walk back to her clothes since the dryer had finished and started folding them; and he began to write on a slip of paper while she was busy. He stopped to look at her again, then finished writing and folded the paper. He slipped the paper into her second basket of clothes unnoticed as she carried the first to her car. Later, at home as she put her clothes away, she found the slip of paper. She stared at it, puzzled, then slowly unfolded it to see the older man’s words. The girl smiled as she read the note, and took a deep breath that filled her lungs with cool air and her heart with hope as she thought about the kind older man who had helped her more with his words than she had helped him with his laundry.